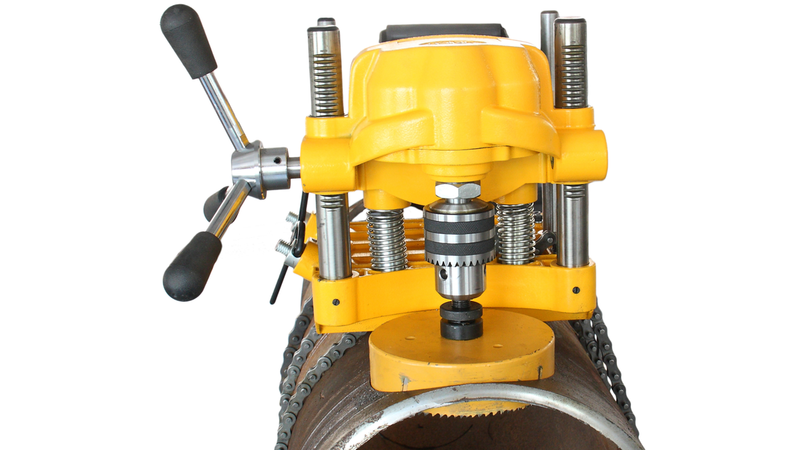 • The Hongli Model JK150 pipe hole cutter is designed to cut holes up to 152mm into steel pipe. • The multiple hole sizes allow the use of fittings for branching unpressurized pipe lines. • The JK150 has a 5/8” (16 mm) capacity drill chuck to accommodate all sizes of hole saws and hole saw arbors. • An integral motor and gear reduction optimizes performance of large diameter hole saws. • The dual-side feed handle allows the operator to use the Hole Cutting Tool from either the left or right side.